Kathy's Cozies: Mickey With a Little Bling! Mickey With a Little Bling! 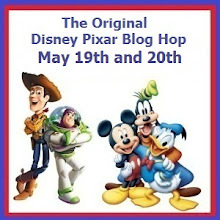 Hello and welcome to the Original Disney Pixar Blog Hop! If you just came from Amy's Blog, then you are in the right place. I love being a part of this blog hop, because it always makes me feel like I'm a little girl again! So, between hops, I'm always on the lookout for new Disney fabrics that will be fun to feature on a new Cozy. When I recently found this fabric on Etsy, I just knew I had to order a few yards. It features Mickey, dressed in his signature red britches and some yellow shoes. Behind Mickey is a background of gray with a swirly black and white paisley design. It's fun, but elegant, don't you think? The red coordinating fabric for this Cameo Cozy provides a striking contrast with the gray fabric. Plus, it matches Mickey's pants perfectly. While the red fabric brings out the fun side of Mickey, I decided to add a little bling (okay...a lot of bling!) to make this Cozy a little more grown-up. Check out this awesome button! And what Cozy would be complete without a little love sewn into it? If you would like a chance to win this Cameo Cozy (or an Expression, E2 or Cricut Personal Cutter Cozy) of your choice, just leave a comment, along with your email address, below. On Monday, May 21, one winner will be randomly chosen and notified by email. If you would like to check out my Etsy store, click here. To see what's happening on my Facebook page, click here. Your next stop on this hop is at Amy's Blog. In case you missed a step along the way, here's the whole lineup. By the way, rumor has it that a Grand Prize Winner will receive a ScrapN Easel-Ette. Be sure to check out all of these amazingly creative blogs for your chance to win some super blog candy! LOVE IT!!!! The fabric is great and the bling is PERFECT! Thank you for being a part of the hop! That is a COOL cozy! I don't have a Cameo,I have one of the original Silhouettes (still love it) and also a Cricut Expression. OMG I think this is my favorite cozy so far! Love the hearts on the side. I want this one!!! Kathy you always seem to amaze me with your beautiful Cozies!!! This Mickey Cozy would look beautiful along with all the Minnie ones you made for me!!! I so love your Cozies :-) and the funny thing is I just ordered the Cameo yesterday. Have to love the BLING!!!! Kathy, this Mickey cozy is adorable, great job! This is gorgeous!!!!! Omg love the bling you added!!! Anything Disney! Your designs are so cute! OMG! I totally love the new cozy! The colours would be perfect in my scraproom, my tables all have red legs. What a great job and even better blog candy. Thanks for the chance to win. How cute is that cozy I love it. But I love Mickey mouse, even have a tattoo of him. That is great fabric...The cozy turned out wonderful. This is just too cute! I love Disney and I have to say that this has to be the best blog hop ever! OMG - I love what you have created! I have my beautiful Silhouette Cameo sitting out - and I know that I'm not as talented as you are... I'd be honored to win and let my Cameo wear something this nice and cute. Wow would this be a wonderful way to dress up any machine! TFS. This is so cute. I love the fabric and the button is beautiful. Fabulous job. Another gorgeous cozy!!! Love that fabric and the bling!!!! Wow, what beautiful blingful fabric you've found for this Hop, for your incredible cozies. I also like the "slightly more adult" version with the blingful button. It's very sweet. Nice joy, thank you for sharing and for the opportunity to win it! What great fabric you used for this one. The little hidden heart is the perfect touch. That is just adorable!!! Love how you added the bling to it. Fabulous!! Love your cozies, especially the Disney ones. That fabric you found is wonderful -- just the perfect blend of childhood and maturity. Love the bling you added to the cozy, as well. I would love the chance to win one of your cozys! Thanks for the chance to win! Oh my goodness I love the mickey cozy!!! TFS and the chance to win one!!! Just love this cosy!! The material is so cute!! Love it!! I would love to win of your cozys. I would love a cozy for my expression. Thanks for a chance to win. Super cute cozy! The heart on the end is so sweet! Thanks for the chance to win something to keep dust off my Expression when I'm not busy playing with it! I love, love, love your choice of fabrics and fabric combinations. (I looked at more than just the Disney/Pixar posts...) I also love that you put a little extra into the item - like your "love" on the end and of course the bling button. Wow just amazing. Love your cozies!!! Thanks for the chance to win. i love the cozy you made!! it looks wonderful!! Oh my gosh Kathy, that is an ADORABLE cozy! I love it! I love to quilt also and haven't seen that fabric before. I might have to go hunt for it to make a wall hanging for my mother in law that loves disney! I love your covers and this one is simply beautiful and adorable!! Would love to win one of your awesome covers!! Thanks! Super cute cozie! Love the Mickey theme and the quilting. You are very creative! Sheer GENIUS! Love...love...LOVE the Disney theme to the cozy. I think the button bling adds a nice touch to the vintage Disney fabric. Omgoodness omgoodness omgoodness if this isnt the cutest thing EVER I LOVE IT!!!! I am a new follower of your blog I can't believe I have never been here before! I hope you can stop my blog whenever you get the chance! Thanks for the Opportunity to win. Love it !! Tfs and the chance to win one !! Wowzers! You were right, that fabric is FABULOUS!! You've got to stop doing this to me! I need all of my covers to match and you keep showing new fabrics I love more! Great job as always Kathy! Love your Cozies!